﻿ Fun Easy English - Environment - Global warming - Climate change Indicators: Ice Breakup in Two Alaskan Rivers. This feature examines the timing of spring river ice breakup in two communities that have kept detailed records for more than 100 years. 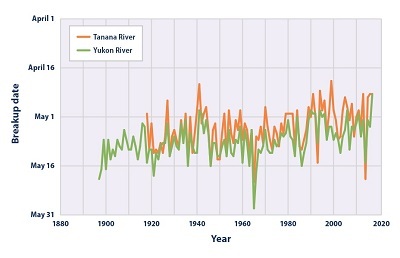 The Tanana and Yukon rivers both demonstrate long-term trends toward earlier ice breakup in the spring. The ice breakup dates for both the Tanana and Yukon rivers have shifted earlier by approximately seven days over their respective periods of record. The 2016 breakup date recorded at Dawson City was the earliest on record. 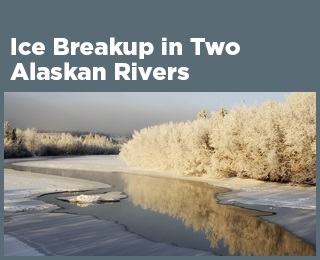 Despite the overall trend toward earlier breakup, recent breakup dates for both rivers are largely within the range of historical variation. Regions in the far north are warming more quickly than other parts of the world, and this pattern is expected to continue1,2 (see the Arctic Sea Ice indicator; for more information about regional temperature changes, see the U.S. and Global Temperature indicator). The Tanana and Yukon rivers in Alaska provide a particularly noteworthy record of northern climate because, for a century or more, local citizens have recorded the date when the ice on these rivers starts to move or break up each spring. In fact, some towns have annual competitions to guess when ice breakup will occur. Since 1917, the Nenana Ice Classic competition on the Tanana River in central Alaska has paid several million dollars in winnings to the people who come closest to guessing the exact date and time of day when the river ice will break up. A similar tradition exists in Dawson City on the Yukon River, just across the border in Canada, where breakup dates have been recorded since 1896. River ice breakup is more than just a friendly competition, though. Ice breakup is an important time of transition for communities that rely on these relatively remote and free-flowing wild rivers for transportation, subsistence hunting and fishing, and other needs. In addition, early thawing can lead to severe ice movement, jamming, damage to infrastructure, and destructive floods. The data collected by these communities highlights how the river ice breakup dates in Nenana and Dawson City have changed over time. Both towns use the same method to measure the exact time of river ice breakup. Residents place a tripod on the ice in the center of the river. This tripod is attached by a cable to a clock on the shore. When the ice under the tripod breaks or starts to move, the tripod moves, pulling the cable and stopping the clock. Besides climate change, natural year-to-year variations and other factors such as local development and land-use patterns can influence ice breakup dates. The two locations featured here are relatively remote and undeveloped, so the ice breakup dates are more likely to reflect natural changes in weather and climate conditions. However, corresponding measurements of water conditions and air temperature would be useful to help understand the connection between changes in river ice breakup and changes in climate. 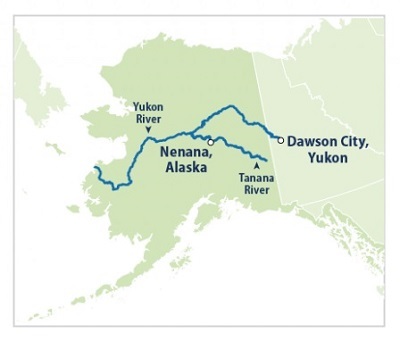 Ice breakup dates for the Tanana River at Nenana and the Yukon River at Dawson City have been recorded and made publicly available as part of two long-running, community competitions: the Nenana Ice Classic and the Yukon River Breakup. The data shown here and other information can be found online at: www.nenanaakiceclassic.com and: www.yukonriverbreakup.com/statistics. Data records of ice breakup dates for these two rivers are also archived by the National Snow and Ice Data Center at: http://nsidc.org/data/lake_river_ice. This figure shows the date each year when ice breaks up at two locations: the town of Nenana on the Tanana River and Dawson City on the Yukon River.